Dental implants can be a lifetime solution for missing teeth, but they can be expensive in the US, Canada, the UK, and Australia. Dental implants in Bangkok allow you to restore your smile without a giant price tag attached. 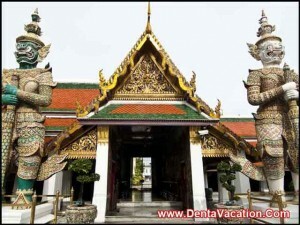 Dental vacations in Thailand are becoming increasingly popular as patients realize the benefits of affordable dental implants in the Land of Smiles. The reason Thailand is such a popular dental travel destination is because of its wide range of activities: besides obtaining quality teeth implants from a competent Thai dentist, you could go bargain hunting at an outdoor market, ride atop an elephant, or visit a Buddhist temple. According to the American Association of Oral and Maxillofacial Surgeons, “69% of adults ages 35-44 have lost at least one permanent tooth.” For those with missing teeth, dental implants could improve quality of living. Dental implants consist of a titanium screw, an abutment, and a crown. The implant fuses with the jaw bone, allowing for placement of the crown. While dentures may inhibit speech and limit the types of foods one can intake, dental implants function as natural teeth and can help patients perform their everyday activities with more ease. With dental implants, there is no fear of “slippage” as there would be with dentures. Additionally, implants can help prevent bone and gum tissue shrinkage because they continue to stimulate the bone even after the original teeth are missing. Many patients report that their dental implants feel and look like their natural teeth. Why Get Teeth Implants in Bangkok? Dental tourism in Bangkok has allowed for many foreign patients to replace their missing teeth at a fraction of the price they would pay in their native countries. With titanium dental implants in Thai capital, you do not have to let the price prohibit you from restoring your teeth. ipment. You can also choose to get same day, all on 8 or all on 4 implants in Bangkok. For those who experience dental anxiety, consider visiting a local dental spa. Dental spas here incorporate the relaxing environment of a bath with the medical care of a dental clinic. Language barrier is not a worrisome problem for those seeking low cost dental implants, as English is spoken in the Thai hospitals of repute. You will be in good hands, as dentists in Thailand must undergo rigorous training much like their Western counterparts. Some even study in the United States or the United Kingdom before returning to practice in Thailand. The trip for your dental implant procedure in Bangkok can easily be doubled as a holiday, as it requires relatively low recovery time before you can resume light activities. Before flying abroad for traditional or immediate load implants in Thailand, it is recommended that you read up on Thai customs to ensure you don’t commit a faux pas. For example, the royal family in Thailand is well-respected and there are many pictures of them across the country. It is important that you do not make any inappropriate remarks about the King and that you stand when his anthem is being played. Buddhism is the most popular religion in Thailand, and you should be respectful if visiting a Buddhist temple. Avoid wearing flashy or revealing clothes (modesty is an important Buddhist principle). Thai cuisine is quite tasty and rich, mainly consisting of some type of meat and spices. Seafood is available at inexpensive prices in Thailand compared to most of Europe. You may want to read evaluations about the dentist who will be providing your dental implants in Bangkok. Dental implants in Bangkok can help restore your smile even if you’re on a tight budget. The treatment for missing teeth is inexpensive, high quality, and fast, allowing you to enjoy the rest of your Thai vacation as you recover. 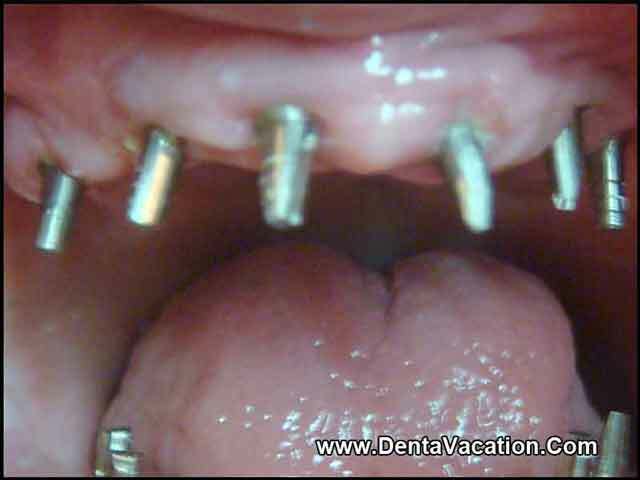 Denta Vacation facilitates low-cost dental implants in Thailand. Fill-out the estimate-request form on the right for more information and a FREE Dental Tourism Guide.